*Savings of $0.25 per book with a maximum savings of $300. 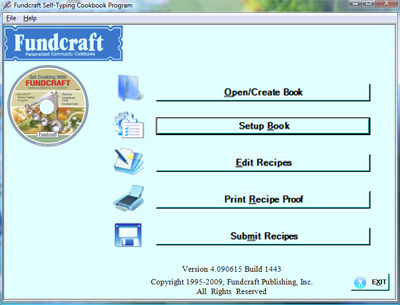 Fundcraft developed Short/Cut™ on CD, the first cookbook publishing recipe typing and collection program on the market. This simple software allows you to enter recipes, sort them into sections, place them in the desired order, print copies to proofread and make corrections. Then simply copy the recipes to a blank floppy disk or CD, and mail the disk or CD to Fundcraft along with a printout of the recipes and the rest of your cookbook order. We will process your recipes with our high speed typesetting equipment and print them in the professional cookbook printing format you select. Short/Cut™ CD Computer Requirements and Program. Select a member of your group who is already a good typist and works frequently on a Windows PC or Macintosh computer at home or work. An average length cookbook will take a good typist about twenty hours to type. Customers who take advantage of the cookbook publishing software Short/Cut™ on CD will also be able to proof online for an additional charge. (This option must be selected on the cookbook order form). However, as you are responsible for typing and proofing your own recipes before submission; recipe changes cannot be made without the deletion of the Short/Cut™ discount. *Note: no discount if we Fundcraft make changes. Short/Cut™ on CD users may receive a hard copy proof of cover, local information pages and dividers at an additional charge; however, proofs of the recipe pages will not be sent since your group will already have a copy. Please be aware that hard copy proofs can delay cookbook printing production by up to two weeks.